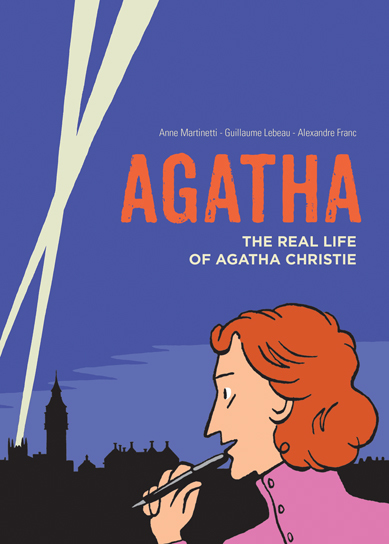 For their latest offering, the fine folks at SelfMadeHero have released an intriguing exploration of the life of the 20th century’s best loved crime novelist, Agatha Christie. Framed around an event in 1926 where she staged her own disappearance, this graphic novel chronicles Christie’s life from its relatively humble beginnings as a child in Torquay all the way to global acclaim and her final years as “Dame Agatha”. Co-written by Anne Martinetti and Guillaume Lebeau, this exhaustive look at Christie’s life is likely to appeal to fans of her work, as well as lovers of strong, modern female role models. That said, while it’s undoubtedly thorough and packed with a dry sort of charm, there’s no getting around the fact that sadly, there isn’t a huge amount of insight to be gleamed about Christie here for the most part. While the events of her life are truly remarkable, the woman herself remains something of a closed book, with the majority of the emotional beats of this biography being met with a strange sense of detachment from Christie herself. There’s enthusiasm for sure, and her unrelenting appetite for life shines through on more than one occasion – but the overall tone is a little more dispassionate than I was perhaps hoping. Thankfully however, the real beating heart of the book comes from the diversions where Agatha chats – and frequently bickers – with Hercule Poirot, perhaps her most famous creation, who shadows her throughout offering dry suggestions on her writing and lifestyle choices. More than anything else in the book, these sequences help to provide a deeper insight into Agatha’s creative process and inner doubts and insecurities, such as they are. The artwork is provided by Alexander Franc, whose undeniably straightforward style goes far further than the words themselves in portraying the free-spirited sense of adventure which typified Christie’s life. Simple it may be, but Franc’s style works wonders in injecting some much needed life into this occasionally dry biography, particularly shining during the sequences where Christie is confronted by Poirot. His colours are also bright and airy throughout; unapologetically simplistic, yet perfectly suited to the tone of the book. Ultimately though, it’s not entirely clear what the true intent of this release is. Is it a mere biography; a chronicle of the significant dates and events in the life of one of the world’s best-loved crime authors? Is it an analysis of Christie’s emotional mindset and her often fractious relationship with her own creations? Or is it perhaps meant as a celebration of the woman and all of her myriad achievements? The truth probably falls somewhere between all three, and while it doesn’t resonate like it perhaps should, the undeniable charm of Alexandre Franc’s artwork – not to mention the intrigue of the leading lady herself – make this an enjoyable, if not quite essential read.